Most people I talk to are not living on purpose. Not enjoying life. Simply enduring. They spend their time regretting the past or wishing it back. They are either looking forward to or dreading some event in the future. Today is just an in-between. They are certainly not taking hold of this moment and making the most of it. I got to thinking about this and made a list. 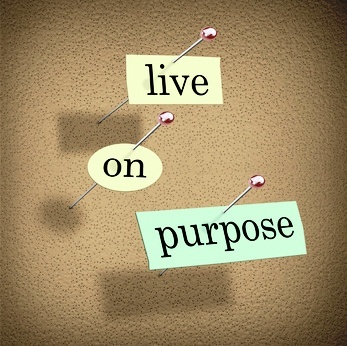 On how you can live on purpose. Make memories. Go to bed at the end of the day with a smile on your face. 1. Pick one small bad habit. Change it. 2. Call someone you haven’t talked to in a long time. Be positive. Encourage them. 3. Stand outside and listen. What do you hear? Take a deep breath. What do you smell? Look around. What do you see? 5. Stop caring what other people think about you. It’s your life, not theirs. 6. Make things happen. Don’t wait for things to happen. If all you do is react to situations, I can pretty much assure you that you’re going to respond exactly the opposite to what you really want to do. 7. Be honest about what you want. Speak up. If you live your life as a people-pleaser, you will let people walk on you even if they don’t know they’re doing it. 8. Don’t let fear stop you. Say no over and over again to the lies that it tells you and live your life on your terms. You won’t be bound by fear, and you will be able to do what you believe is right, regardless of how terrifying it is. Fear wants you to fit in, to be mediocre, to do nothing that matters, to fly under the radar. It’s much easier to give in to fear. Take the hard and rewarding road. 9. Take responsibility. You can’t control the people around you, and you can’t control many of your circumstances. But you have complete control over yourself. Don’t blame the people around you, or the economy, or the weather, or your age. Just be wise enough to rise above it all or you’ll never get out of your victim mentality. 10. Be a positive person. Taking responsibility will certainly help with that. It’s difficult to be upbeat when you believe that your destiny is controlled by your circumstances. Listen to yourself when you talk or think. 11. Connect with people. Intentionally. It just makes life more fun. 12. Read. There’s no better way to change yourself than reading. A former pastor of mine always said, “Who you are a year from now is largely dependent on the books you read.” So true. 13. Be thankful. Being thankful just requires you to open your eyes a little more than you usually do. 14. Choose your emotional responses. You choose to stress. You choose to be angry. The situation may seem out of your hands, or it may seem like someone else’s fault, but realize that it’s always your decision how you react. Do something. Today. No more excuses.